The new builds can be downloaded from the Apple Developer Center, or as over-the-air updates for devices enrolled into the testing program. Public beta versions are usually released a few days after the developer beta is distributed. The fifth developer beta for macOS 10.14 Mojave is build number 18A347e, replacing the fourth build's 18A336e. Productivity changes feature heavily in macOS Mojave, including the introduction of Stacks, a feature moving form the dock to the desktop, which can be used to group files by type automatically. Finder changes include a Gallery view that shows media and its metadata, alongside a set of contextual quick actions that can be used to perform custom automator actions on files. Quick Look has been updated to allow users access to Markup without leaving the menu, and for videos, the option to trim clips without requiring a separate editor. A new screenshot HUD makes it easier to take images and videos of the Mac desktop, while also lowering the load on the processor. A new Continuity Camera function can be used to insert images into a document on macOS sourced from a nearby iOS device's camera. The shot transfers automatically to the macOS app, without any need to manually send the image over, such as by AirDrop. Apple informed developers at WWDC of an ongoing project to allow iOS apps to run on macOS, with a number of first-party apps being used to trial the technology. News, Stocks, and Voice Memos are the ported iOS apps made to run on macOS, along with the Home app, which can be used to manage a HomeKit network. The Mac App Store is being refreshed, borrowing a number of aspects from the iOS App Store, including video previews of apps. Machine learning technologies Create ML and Core ML2 are included, as well as a new Dark Mode interface that turns the macOS UI to a darker shade. The fifth iOS 12 beta, build number 16A5339e, replaces the fourth beta's build of 16A5327f. 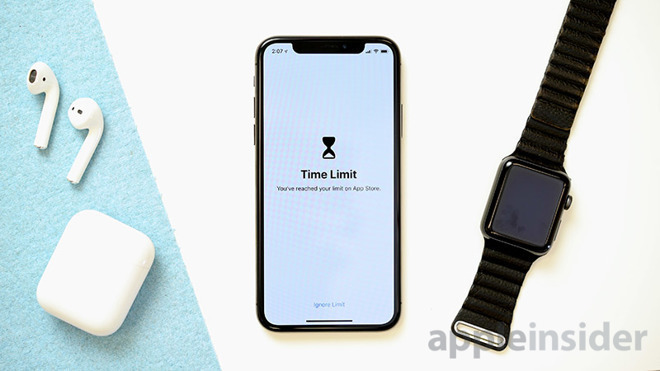 Apple has made iOS 12 more useful for owners of older iPhones and iPads, with performance improvements aimed at improving the experience for those devices, along with newer models. Owners of iPads will also be able to use some extra gestures and see notification grouping features borrowed from the iPhone X. Digital health is a focus of the new version, including the Screen Time function that can be used to monitor app usage and restrict access to apps, in order to help reduce a user's dependency on certain types of apps, such as games or social networks. Updated versions of stock apps, including News, Weather, Stocks, and Voice Memos, are included in iOS 12, along with a brand new first-party app "Measure," which will use ARKit to determine the dimensions of real-world objects using the device's rear camera. Other updates in the operating system include third-party map support for CarPlay, MeMoji, group FaceTime, and the new Siri Shortcuts. Apple's fifth developer beta for tvOS 12 has build number 16J5334e, replacing the fourth beta which had build number 16J322d. A major change to tvOS 12 is the inclusion of support for Dolby Atmos surround sound, which can locate sounds in 3D space for the viewer, without relying on setting up discrete channels like traditional home cinema systems. More home control systems will also link their remotes to the Apple TV in the release, and will also include support for Siri interactions. The inclusion of cross-device Autofill will allow users to sign into apps on the Apple TV using credentials from an iPhone or iPad, saving time from having to enter them a second time. For some cable services, Single Sign-On could become Zero Sign-On, with the Apple TV automatically signing users into channel apps after detecting what provider's network is being used, and their channel package. More cable services have also advised they wish to use the Apple TV as an alternative to the cable set-top box. Charter Spectrum intends to use the Apple TV later in 2018, with France's Canal+ and Switzerland's Salt also set to do the same. The famed Aerial screensaver will get a new "Earth" view, showing the planet as filmed from the International Space Station. While in Aerial, users can also see more details about pictured locations by swiping and tapping. Up from the fourth build of 16R5322d, the fifth watchOS 5 beta is build number 16R5334f. The big change to watchOS 5 is the Walkie Talkie app, namely push-to-talk communications with a specific contact via the Apple Watch. Pressing the on-screen button opens the line of communications to the remote Apple Watch, which will play what is transmitted through its speaker. The Siri watch face has been changed to accept third-party apps, including those provided by Nike. Users can also activate Siri by raising the wrist to their face, rather than using the "Hey Siri" vocal prompt. For fitness, users are able to sign up for week-long activity competitions against other contacts, with awards on the line and progress updates shared between participants during the competition period. Specific types of workouts are allowed in the mode, including hiking, yoga, and 12 others, as well as running outdoors with pace alerts. Automatic workout detection is added, and a stress detection feature alerts the user, if it determines they have stopped exercising for some reason. AppleInsider, and Apple itself, advise against installing beta releases on mission-critical hardware, due to possible data loss. Anyone willing to install the betas should use non-essential secondary devices, and to retain backups of any important data before updating or installing the software.